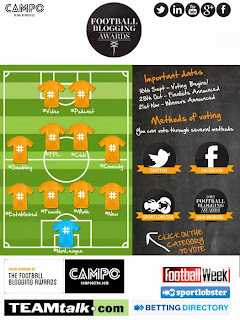 So, it's that time of year again; The Football Blogging Awards! Most of you will know that last year through your immense support The Liver Bird won best #Female blog at the inagural event, you can read the story of that night here. This year the awards are bigger and better and there are some cracking blogs in the #Female category entering the race! Please take a look at the Football Blogging Awards website to read some guest posts from all the blogs in each category. As you can probably tell, The Liver Bird needs all the help it can get and I would really appreciate your votes, shares, retweets whatever, it all helps and I sincerly appreciate it!